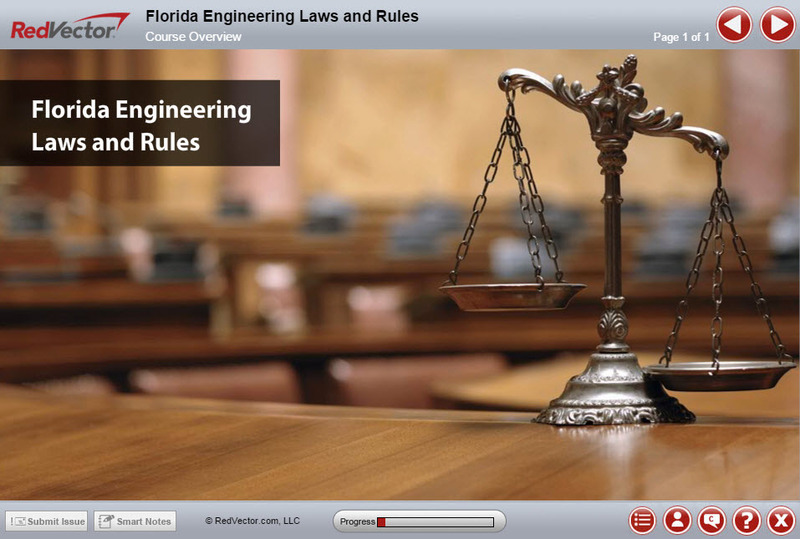 RedVector is proud to release a new course, Florida Engineering Laws and Rules. This hour-long course is mobile-ready and will satisfy the new Laws and Rules requirement for Engineers licensed in Florida. It is important for engineers to avoid illegal activity or immoral conduct by familiarizing themselves with Florida’s laws and rules. The purpose of this course is to provide engineers with the bare essentials of laws pertaining to their field in the state of Florida. The rules presented here are not intended to serve as a substitute for actual statutes and laws but rather as introductions and summaries of the law per the 2014 Florida Statutes. By the end of this course, you will be able to describe how to obtain licensure as an engineer in the state of Florida, list the requirements to meet all obligations for a certified business organization, recall important sections within Chapter 455 of FL Statutes and Chapter 61G15 of the FL Admin Code, avoid violations as an engineer, demonstrate what to expect of the disciplinary process if you do make a mistake, and identify additional rule changes that have been made since 2012. This RedVector course was authored by Susana Kuehne. Ms. Kuehne is a technical writer with mechanical engineering education from both the University of Rochester and Virginia Tech. Her work with NASA Langley helped her make the decision to combine her writing skills with her scientific background and follow a path to technical writing.